“Crack Kills”, and that sure as hell is shown in this movie. Nino Brown (Wesley Snipes), a drug dealer at the dawn of the crack cocaine epidemic, enriches himself and enslaves his people via an inner-city crack factory. Meanwhile, cop Scotty Appleton (Ice-T) will do anything to penetrate Brown’s empire. The message of this main movie is that drugs will ruin your life and put you for the bad. The heart of this film lies within its ability to show the drug life and how it can screw you up in every way. Through director Mario Van Peebles constant sights of slum infested New York the message becomes clear and in effect. 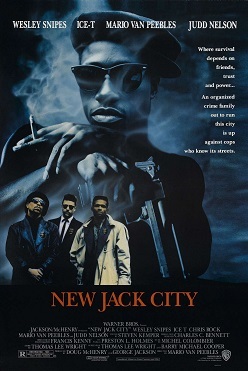 When I first saw the trailer for New Jack City, I thought it was going to be one of those slam-bang action thrillers, but too be honest it is very honest and true in its depiction of the Crack epidemic and the people that lived it. In the film rehab is shown and how the drug life can affect your body but how your not totally out of the game and still get back up. The one thing I mostly have to praise is how everybody talked in neighborhood language. The film takes dialouge that would be easily digestible to the natural audience, and sort of turn it on its side and make the viewer think about what that character said. This movie has that sort of authenticity and place that I enjoyed and thought was great. Wesley Snipes creates the character Nino Brown and gives him this inventive attitude and loveable personality that he ends up being the bad guy that you still like. Without Nino Brown many films today about the drug trade wouldn’t have such an engaging character if it wasn’t for Wesley pulling this great character from under his hat. There were some bad things I didn’t like in this film. The one thing that sort of got to me was how much of the film had many references to other gangster movies such as The Godfather and Scarface and many of them are pretty obvious. I just felt like this didn’t make them seem like their own film and it didn’t show its own independence. Despite Nino Browns great character none of the other characters are as engaging as him and this didn’t make me feel too close to them or have me relate to them. Also Ice-T is not a very convincing undercover cop having many of his lines feeling as if they’re forced and he wasn’t very believable. This movie brings out all the stops to show off the message it has. This film works as an anti-drug movie and a drug-gangster movie that shows a lifestyle nobody should try to follow. Very good blog you have here but I was curious about if you knew of any forums that cover the same topics discussed in this article? I’d really love to be a part of group where I can get feed-back from other experienced people that share the same interest. If you have any recommendations, please let me know. Kudos! Hello there, I absolutely wanted to comment your site. Several words: the amazing! Many thanks and I hope you are going to post a growing number of! Thanks for the marvelous posting! I definitely enjoyed reading it, you might be a great author.I will make certain to bookmark your blog and will often come back at some point. I want to encourage you continue your great posts, have a nice evening! Hi all, I absolutely desired to comment your website. Few words: the amazing! Thanks a lot and I hope you can post a lot more! Greetings from Florida! I’m bored to tears at work so I decided to browse your blog on my iphone during lunch break. I love the info you provide here and can’t wait to take a look when I get home. I’m surprised at how quick your blog loaded on my mobile .. I’m not even using WIFI, just 3G .. Anyhow, fantastic site!